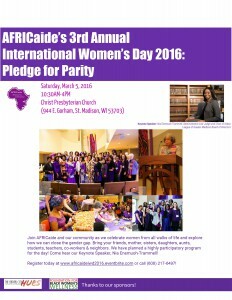 For the third time in a row, AFRICaide (http://www.africaide.org/) , a local community organization, and women in the community are organizing a conference to celebrate International Women’s Day on Saturday March 5, 2016. We will be having speakers and small group discussions on Gender Parity from the local to the global level. The conference will go from 10:30 am until 4:00 pm. Attorney Nia Enemuoh-Trammell is our keynote speaker this year. She is a dynamic community leader who works as a Administrative Law Judge in the Division of Workers’ Compensation. She is also the current Chair of the Urban League’s Board of Directors. Dr. Barbara Bowers from the School of Nursing and Dr. Ketty Thertus from the School of Medicine will be participants on our panel of experts.